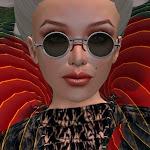 Back when this blog began, 750 posts ago, there were few blogs that did write-ups and reviews of great content and installations in Second Life. This has changed dramatically, especially over the past year. Today, a number of academic journals are gearing up to focus on virtual content, and they will be the appropriate venues for most of the topics we've been covering lately. I like to think Not Possible IRL has raised awareness of quality content, not just in Second Life but in other virtual worlds where User Generated Content is possible. We've certainly showcased a lot of extraordinary talent and work. 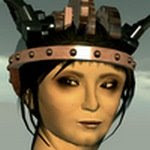 I've had dozens of brilliant collaborators, chief amongst them Alpha Auer (aka Elif Ayiter), who blogged at least 100 meaty posts. Alpha is not only an academic, and a spectacular virtual artist in her own right, but also an inspired thinker and writer. Of course, none of this would have been possible without the intoxicating encouragement, imagination, resourcefulness and originality of the members of my virtual working group, Not Possible IRL, all of them Giants of the metaverse. Instead of tiring of it, my interest in great 3D immersive content is at an all-time high, so I'm not going away, just redirecting my energies in new ways. A big thanks to all who have been so supportive, galvanizing me to look in this direction and that... leading me to uncover (and showcase) treasures (and people) under every pixelated rock and leaf. Don't stop. I'll still be twittering my adventures and discoveries, so feel free to track Bettina Tizzy there. 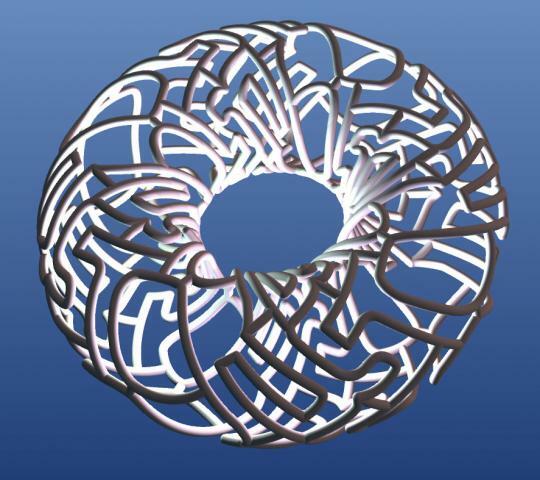 Seifert Surface (aka Henry Segerman), a mathematician and also a bodacious creator of both virtual and real math-inspired art, is doing so many new and fun things that I had to get out of my blogging funk long enough to post this. Three years ago, and over on his New World Notes blog, Hamlet Au did a great write-up on Seifert's recreation of Robert A. Heinlein's fictional "Crooked House" in Second Life, a house shaped like the unfolded net of a tesseract. " --And He Built a Crooked House" is a scifi short story about a mathematically inclined architect who "has what he thinks is a brilliant idea to save on real estate costs." Now Seifert has shot two videos in-world so that even non-Second Life'rs can have a look and understand what it's like to walk inside it. It's 'the awesome,' don't you think? 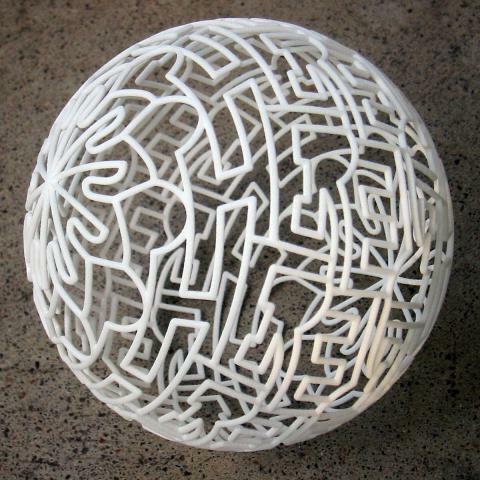 And just in time for Christmas shopping, eight of Seifert's math-inspired investigations and sculptures have come to life, thanks to Shapeways' 3D printing. I'm buying as soon as I finish this blogpost. Prices range from $12.95 to $57.29.